Communities In Schools is the nation’s leading drop-out prevention organization. 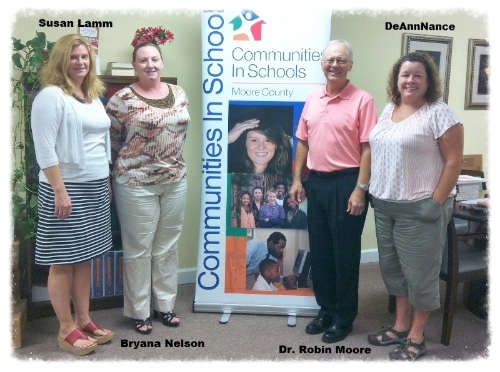 Communities In Schools is the nation’s leadingdrop-out prevention organization. With school in full motion and our programs underway, the last couple of months have been very busy! 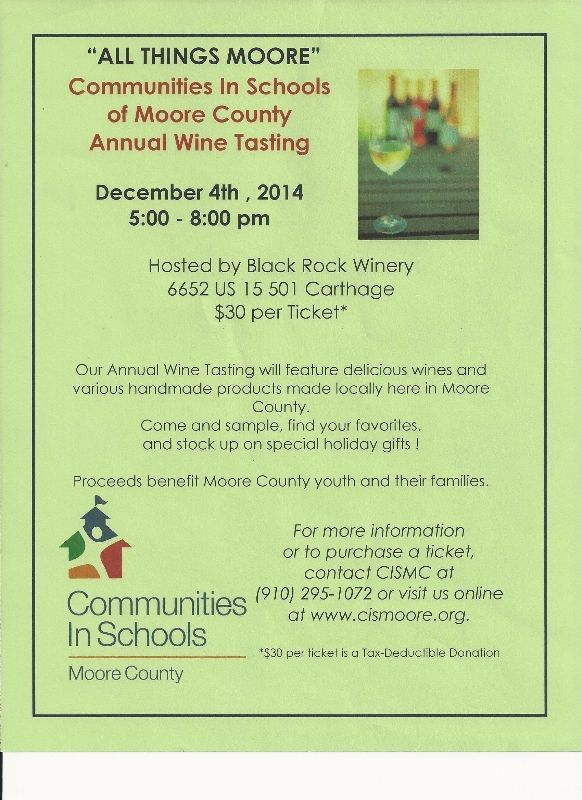 CISMC is planning for our wine tasting event “All Things Moore” that will be held at Black Rock Winery on December 4th from 5pm to 8pm. Moore County artisans will showcase their work and have pieces available for purchase. The unique wines of Black Rock will be available for sampling and purchase as well! This will be a great opportunity to purchase some holiday gifts! Tickets are on sale for $30 and can be purchased by contacting our office 910-295-1072 or visiting our website at https://moorebuddiesmentoring.com. Tickets can be purchased on our website by clicking here! Our annual Thankful Dinner is being held on Wednesday, November 12th at Emmanuel Episcopal Church in Southern Pines. CISMC holds this annual dinner as a way to say thanks to all of our mentors and their families as well as the families that we are so grateful to work with. Each year, the number of attendees is greater and greater as we expand our efforts further into the community. We are proud to be able to be a part of so many families in Moore County. Two years ago, we started recognizing one mentor who has consistently gone above and beyond with their mentee. The mentor is presented with the Expanding Horizons Award at our Thankful Dinner. This year’s winner is Linda Pearson! Linda has been a mentor for over three years seeing one youth through middle school and transition into high school. Linda is currently working with another 8th grader. The Expanding Horizons Award is only a small piece of the gratitude we want to express to Linda Pearson and her relentless dedication to the youth in Moore County. Thanks, Linda! To contact Bryana please email her at bryana@moorebuddiesmentoring.com or call the office at 910-295-1072! Moore Family Connections has finished another round of classes in Carthage and Southern Pines. MFC has served over 85 youth and their families this past year. A new Southern Pines class will start November 6th at Page United Memorial with eight families. MFC will also offer a class in the Robbins area within the next couple of months. It’s easy sometimes to get caught up in the numbers and making sure the classes are full and we are not over budget. However, working with each family for over 12 weeks and after they have learned to trust you and the other families enough to open up about their challenges, it makes it very clear just how important this job is to them and to me. Every now and then a family will enter the class that has so many things to overcome from the past and present. However, seeing them smile when they are around each other amidst such constant adversity in their lives and the pride in their eyes when they receive their certificate of completion touches my heart. I wanted to share what one father wrote after completing the class: “I have really enjoyed being here with my kids. We always look forward to coming. It not only brought us closer together, but it has taught me better ways to deal with my children in a loving and caring way. The things that were taught gave me more patience and thought about raising kids. And, as a single dad of five children, I really needed this class. All in all, anyone who has a family and would like to know how to cope better and need to know how to show their love for their family should really come to this class.” –Y.M. Please contact Bryana Nelson at bryana@moorebuddiesmentoring.com or call the office at 910-295-1072 for more information! Or view our website here! Bryana Nelson and Susan Lamm attended the National Symposium on Juvenile Services​ in Greensboro in October. It was empowering to hear how agencies across the nation are working to make our communities stronger and safer through their work with juveniles and their families. There were several interesting “break-out” sessions offered. Worth noting was the session on “Juvenile Justice Reform in NC– A Success Story”. Of course, it revealed through quantitative data how NC has embraced the shortcomings of the juvenile justice system to decrease juvenile crime across North Carolina. The reason? Working closely with community resources such as Communities In Schools, which offer direct and effective support services throughout their community. A couple of great examples that are making a HUGE impact on juvenile justice reform in our communities are parenting classes, which we offer here at Moore County CIS, and mentoring– CIS offers two mentoring options: In-school and community-based. The statistics for youth involved with a mentor are overwhelmingly positive: 52% of youth working with a mentor are less likely to skip school than their peers, and 46% are less likely to start using illegal drugs. It’s not magic. It is merging people in need with dedicated people who want to make a difference! If you are interested or think you might be interested in one of our programs, whether as a participant or as a volunteer, please give our office a call! YOU are the reason we’re here! Please contact Susan Lamm at susan@moorebuddiesmentoring.com if you would like to mentor a student in the community instead of the school setting. Please visit our website for more information by clicking here! CIS In-School Mentoring: Off to a Great Start! The Southern Middle School In-School Mentoring began in September with six returning mentors renewing connections with students from the previous school year. We have three additional returning mentors, one who has begun meeting with a new mentee, one who is scheduled to meet with a new student, and one who will reconnect with his former mentee in November. We have six new mentors who have completed their training and have been matched with mentees. Students are excited to be participating in the program and look forward to meeting their mentors each week. In addition to spending time with their mentors, students have been identifying their deams for the future and articulating goals for the school year. Also, students will be touring Sandhills Community College during second semester to help them realize the opportunities available to them after high school. There are still students who need mentors. If you or someone you know would like to make a difference in the life of a child, please contact Robin Moore at robin@moorebuddiesmentoring.com or by telephone at (910) 295-1072 or visit our website by clicking here! The CIS Reading Buddies program is designed to help second grade students at Aberdeen Primary School and Southern Pines Primary School improve their reading skills. Through the use of trained volunteers, CIS Reading Buddies provides students an opportunity to reinforce the literacy skills they learn through the approved literacy curriculum. To prepare volunteers for their Reading Buddies assignment, they will complete in-service training, which will provide them a “tool kit” of skills synchronized with existing curriculum to bring to the classroom. In addition, volunteers will receive orientation to school expectations and Moore County Schools’ policies and procedures. Volunteers will work with the second grade classroom teachers during the literacy or intervention blocks of instruction. Students, divided into small groups by teachers, will practice and develop mastery of the skills. The classroom teacher will direct individual students or small student groups to work with their Reading Buddies volunteer. The improvement of comprehension skills will be emphasized during the small group or individual activities. Evaluation of the program will be ongoing throughout the school year. Student and teacher assessments along with overall student achievement scores will be used as variables for the evaluation process. 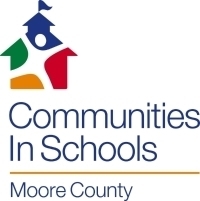 Student achievement data will be provided by Moore County Schools. The first orientation/training session for the CIS Reading Buddies program was held at Southern Pines Primary School on October 23 for nine volunteers. The Reading Buddies will devote one hour per week to tutor students at Aberdeen and Southern Pines Primary Schools. Five of the volunteers will begin working with second grade students at Aberdeen Primary during the last week of October. Reading Buddies will be assigned individual students or small groups of students who need additional help with literacy skills. The training provides some specific tools for Reading Buddies to use with their students. Additional training dates are being scheduled. Please contact Robin Moore: robin@moorebuddiesmentoring.com if you would like to serve as a Reading Buddies volunteer. Click here to go to our website!